A New Jersey man was so loved, he had two competing obituaries when he passed away Tuesday — one from his wife and another from his girlfriend. Leroy B. Black, of Egg Harbor Township, died Tuesday from lung cancer due to fiberglass exposure. He was 55. An employee at Greenidge Funeral Home said there were two obituaries because 'the wife wanted it one way, and the girlfriend wanted it another way,' Philly Voice reported. 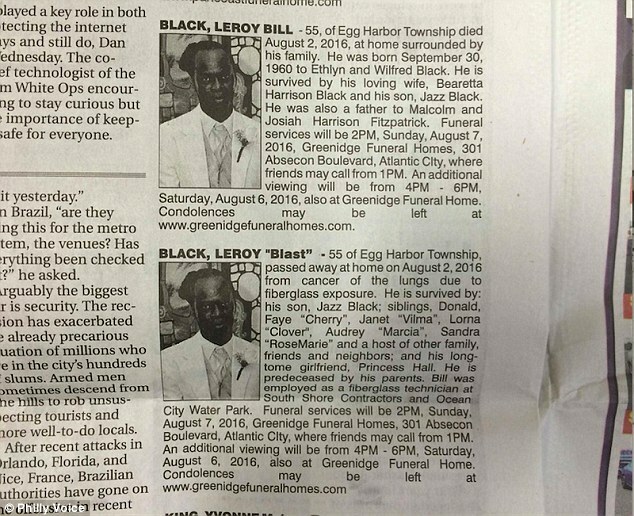 The obituaries didn't even agree on what to call Leroy. Black was a fiberglass technician at South Shore Contractors and Ocean City water Park. He is also survived by his son Jazz Black.